Kingdom of Nepal is a fascinating country, the only country in Asia never to be colonised – its unique and often mysterious culture remains intact. Mountains dominate the landscape: of the world’s ten highest peaks, nine – including Mt Everest – are located within its borders. Isolated from the world until modern times, to the north lies the Tibetan plateau and China, and the east, south and west: India. Elevation plays a major role in the climate. In the higher mountain ranges such as Pokhara temperatures can be cooler (22 degrees), and in the Terai (jungle region) and Kathmandu Valley the climate warmer – all areas we visit. Nepal’s indigenous population consists of two major groups; the Indo-Nepalese and Tibeto Nepalese: all wonderfully welcoming people. 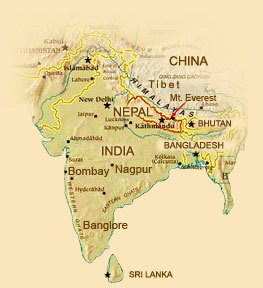 The principal locations of Nepal are Kathmandu, Patan and Pokhara; these are all places we visit. Hinduism and Buddhism are the over-riding religions and Nepali is the official language. English is also widely spoken in developed areas. The currency is the Nepalese rupee. The population 27 million. As Nepal has never been colonised it has developed a self-contained culture and society. Modern facilities are available in Kathmandu – the city has embraced tourism – however the country has retained its pagoda temples, ancient architecture and unique religious practices. The Nepalese are renowned for their smiling faces, humbleness and good nature – they also have a great sense of humour! From remote villages, to magnificent landscapes and a fascinating culture: we promise to make your visit to Nepal breathtaking. The majority of people working for Angel Holidays are Nepalese to enhance your experience and maintain our ethical mission (this website was made in Nepal). You can eat very reasonably in Nepal; under 4 gets you a good quality meal in most tourist class restaurants. We have provided a nice combination of full/half board and B&B accommodation to allow you to enjoy the fascinating mix of Nepali, Indian, Chinese, Tibetan and Western restaurants in the country – choosing where to eat in some fascinating little places is part of your holiday! Vegetarians are catered for. Accommodation in Kathmandu and Pokhara is comfortable tourist class. In the old city of Bhaktapur you will stay in clean and comfortable guest house(s). In Chitwan you will stay in a jungle lodge/hotel with character. Lodges are rustic but clean with en-suite facilities. Please note accomodation is chosen for its Nepalese character, comfort and uniqueness to enhance your experience. No international hotel group is used. Within the group you’ll meet fellow travellers from all walks of life. There’s a good number of single travellers too. Ages range from people in their twenties to retirees. All ages are welcome. At the welcome (and other dinners) there is a nice social atmosphere as well as the friendship you’ll get from the Angel Holidays team. On your journey you’ll experience at first hand the unique and often mysterious culture of Kathmandu Valley, you’ll spend time in the exotic jungle and stay in Pokhara; nestled below the Himalaya. Temperatures are pleasant and warm and our tour is a little different in that you’ll see aspects of Nepal beyond that of tourism. We’ll give you free time where you can explore on your own: please don’t expect a typical regimented tour. You’ll have some fun too! On the holiday you will be well looked after. We’ll have a British tour leader (often Steve Carver) as well as Nepalese staff within the team. Angel Holidays employs local people as part of its ethical mission to support the host nation and give travellers a real experience of this fascinating culture.